Because of the 10 nominations, it is extremely hard to pick and choose a favourite. Especially when four of my all-time favourite movies (Inglourious Basterds, Up in the Air, An Education and District 9) were all nominees. 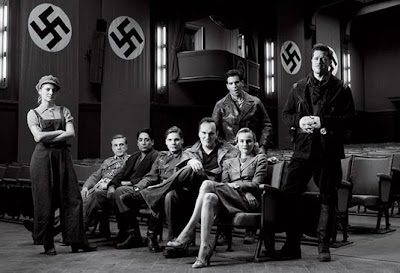 But to be honest, even though I watched Up in the Air four times in one week, I was obsessed with An Education's style and allround fabulousness, and I covered by English book with funny pictures of Wikus from District 9, I will have to say Inglourious Basterds is my favourite. Here is my original review (rating has since gone up to 10/10, obviously), and also a post I did after watching it a second time (and totally falling in love with it). Why did I choose this one and not the others? Find out later when I post a review on it (I am in the process of watching it again...). And, well, none of the other movies really appealed to me. For direction, I definitely would have picked Kathryn Bigelow. Best actress? I totally wish it were Carey Mulligan who got the award, but Sandra Bullock did deserve it. Best actor? Colin Firth, just coz I love him. I haven't even seen A Single Man yet (grrr, I want to!). And, well, they missed out a lot of people and movies last year. Like The Hangover, (500) Days of Summer, Joseph Gordon-Levitt, Diane Kruger, Melanie Laurent, Abbie Cornish...so many opportunities in 2009. Now we have 2010.